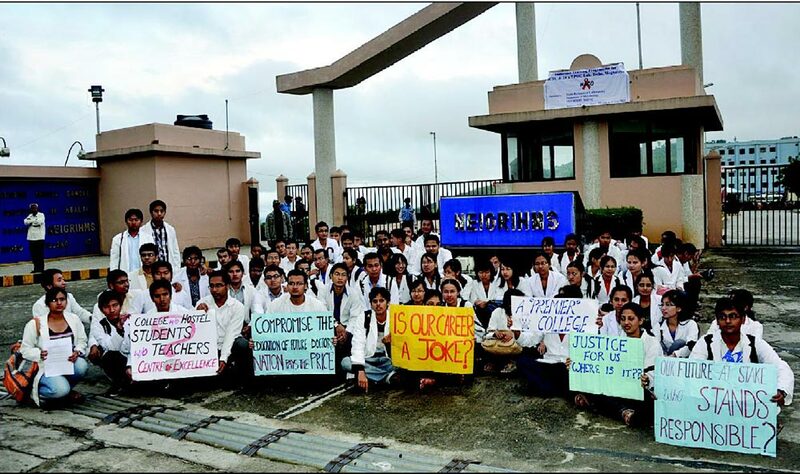 SHILLONG: The MBBS students of NEIGRIHMS have pleaded with Union Health Minister Ghulam Nabi Azad to intervene on the problem of shortage of faculty members in the Institute. “We want the Union Health Minister to intervene on this serious issue and improve the faculty strength in the Institute,” the students told reporters here on Tuesday. Stating that they have lost faith in the administration of the Institute as it has failed to resolve the problem for the last three years, the students said, “It is only the Union Health Minister who can come up with a solution to this problem.” The students said they are concerned about their future since the MBBS courses in the Institute are yet to be recognised by the Medical Council of India (MCI). According to the students, the status of the number of faculties serving in the Institute does not even match up to the bare minimum requirements laid down by the MCI. “As per the MCI criteria, a medical institute has to have a minimum of 69 faculty members. But sadly at present there are only 29 faculty members at NEIGRHIMS,” the students said. What is of concern is that when the Institute started there were 34 faculty members but in the past three years the numbers have fallen instead of increasing, the students rued. The students said the state of undergraduate education at the so-called, “centre of excellence,” is indeed sorry. According to them, there is shortage of faculty members even in those departments which are hardest hit by this problem. “The situation in NEIGRHIMS is really pathetic. The teaching in clinical and theory is in total disarray. All this compromises the quality of education of students who are supposed to be the future doctors of the nation,” the students said. However, they also informed that the present faculty members have repeatedly voiced their demands before the administration for more recruitment for smooth functioning of their respective departments. “Instead of adding to the number of doctors, the present situation has compelled many faculty members to leave the Institute,” said the students. When asked about the interview on the recruitment of faculty in February last, the students said they are demanding from the administration to announce the results of the interview at the earliest. “We are concerned that if the results of the interview are not announced within next February it would lapse. With the administration claiming that they are spending nearly Rs 3 crore on the advertisement for recruitment of the faculty it would be a huge loss of public money if it lapses,” the student said. If there is continuously delay in announcing the results, the students said many of the qualified faculty members who want to join this Institute would be forces to find other alternatives. “This would mean that the Institute would lose the service of these faculty,” the student said. Meanwhile, the students continued their indefinite strike for the second consecutive day, on Tuesday, demanding for immediate increase in the strength of teaching faculty at the Institute. The students gathered in full strength in the OPD after they were not allowed to enter the administrative block. They had begun their indefinite strike on Monday by suspending all academic activities. They were forced into this unfortunate situation by the appalling lack of concern of the administration for the past three years since the MBBS course was initiated in the Institute. Replying to a query, the students said they would continue with their agitation until the recruitment process started. Meanwhile, the Institute authority has already formally appealed to the MBBS students from abstaining from their respective classes and to immediately join back their classes in their own academic interests. The process of recruitment of faculty had already been initiated and the Institute authority has assured them that the process is being expedited. The administration/Director had earlier appealed to those students to come forward for dialogue, but the students are yet to respond to the call, an official statement claimed.